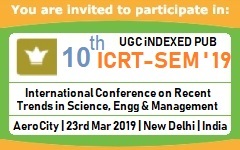 Publication and Indexing: Papers will be published into the volume of MATEC Web of Conferences (ISSN: 2261-236X), which is indexed by Ei Compendex, Scopus, Inspec, DOAJ and CPCI (Web of Science). Keynote Speakers : Prof. Jan Awrejcewicz, Lodz University of Technology, Poland; Assoc. Prof. Vsevolod V. Koryanov, Bauman Moscow State Technical University, Russia. Conference Highlights :Conference Committees Chairs: Prof. Yury Razoumny, RUDN University, Russia; Assoc. Prof. Vsevolod V. Koryanov, Bauman Moscow State Technical University, Russia.